It was a back and fourth first half, and the teams would trade the lead multiple times. The Patriots would get three passing touchdowns from QB Tom Brady, one to TE Rob Gronkowski and two to WR Chris Hogan. The Texans would get a touchdown pass from QB Deshaun Watson to WR Bruce Ellington and an EDGE Jadeveon Clowney fumble return for a touchdown in addition to two field goals to keep New England’s lead at 1 at half. In a wild second half, the Patriots would finally seal the victory with a Brady touchdown pass to WR Brandin Cooks and an interception on the hail-mary pass at the end of the game. With that, we give you our PFF exclusive takeaways from the contest for each team. 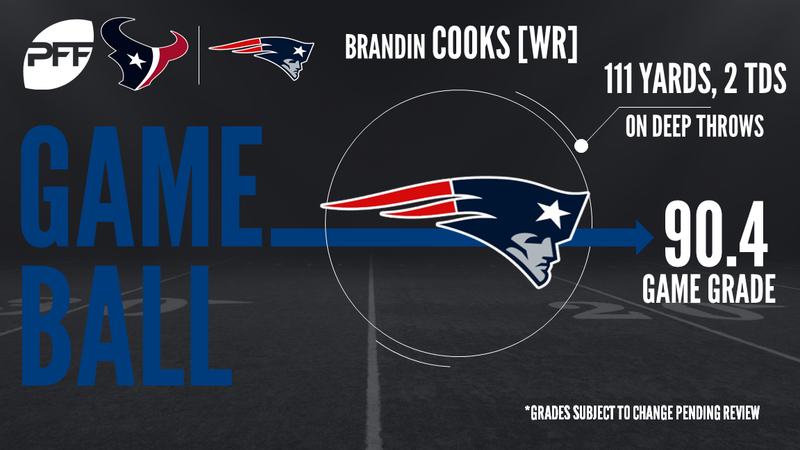 After a relatively quiet first couple of weeks as a Patriot, Cooks made his mark in front of the New England faithful to lead another Patriots comeback. 111 of his receiving yards and both his touchdown catches came on passes aimed 20-plus yards downfield including his majestic game winner that sends the Patriots to 2-1. This was not a flawless performance from Tom Brady, pressured on 15 of his 42 dropbacks, Brady’s internal clock appeared to be off fumbling three times on sacks as he took too long getting rid of the ball when clearly under pressure. However, he shook that off as only Tom Brady could with some stunning throws late in the game to lead yet another Patriots comeback. The game winning score to hit Cooks in the window he did with Jadeveon Clowney in his face will go down as one of the throws of the season. Flowers was once again a workhorse for the Patriots with only Kyle Van Noy, Malcolm Butler and Devin McCourty registering more snaps. His six pressures (1 sack, 2 hits, 3 hurries) takes his season total to 17 pressures already, three weeks in and already more than one-third of the way to his total production from last season. Flowers’ three stops were tied for second-most on the team. Bright spots were few and far between for the Patriots on defense but Cassius Marsh impressed against run and pass, getting the better of his rotation with Deatrich Wise this week. His strip sack of Deshaun Watson was his first sack since Week 15 last season against the Rams. Another enigma of a performance from Watson, who showed glimpses of brilliance but was again culpable for some of the pressure he brought upon himself. Watson was responsible for more pressure (1 sack, 2 hits, 2 hurries) than any of his individual offensive linemen were charged with but when he was under pressure he evaded it and kept plays alive superbly. Still far from polished but this was another huge step in the right direction from Watson and so very nearly a signature win early in his career. Watson complete 11/19 passes aimed 10+ yards downfield and is trending upwards with his performances very quickly. The Clemson connection between Hopkins and Watson will be crucial this season for the Texans. Both inside and outside of structure, the Texans’ duo was in sync this week with Watson hitting Hopkins on three intermediate passes after mostly finding Hopkins on short passes a week ago in Cincinnati. The rest of the offense showed up this week for Houston and if a big game from Watson and Hopkins sparks the Houston offense, they may just take off yet. Watt got off to a fast start in this game, racking up his three stops (2 tackles for loss and a tackle for no gain) on the Patriots’ first four defensive snaps. The impact on the stat sheet from there may not have matched that but his impact went beyond the box score, even setting up Jadeveon Clowney’s second sack by running through LT Nate Solder to knock him down and allow Clowney to turn the corner for the sack. You have to take your chances when you get them against the Patriots, and in spite of a strong showing, competing with Rob Gronkowski in the end zone and breaking up the penultimate defensive play of the game, this will ultimately be a game of missed opportunities for Moore. He failed to bring in the interception on that pass breakup as he rose above Brandin Cooks and then on the decisive play of the game he was just boxed out as he worked over to the sideline for the game winning score. On such fine margins are games won and lost.